We get inflation data tomorrow, although it probably won't put the story to bed. The FT reports "According to economists, January's figures will show headline US inflation easing to 1.9 per cent from 2.1 per cent in December, while the "core" rate — stripped of volatile components such as energy and food prices — will dip from 1.8 per cent to 1.7 per cent." See the chart on the next page. If so, that should make the stock market happy, right? The FT quotes the chief analyst at JPMorgan As-set Management: "I don't see any sign of inflationary pressures." New York Fed chief Dudley called the sell-off "small potatoes" (while conceding four hikes instead of three might be the outcome). 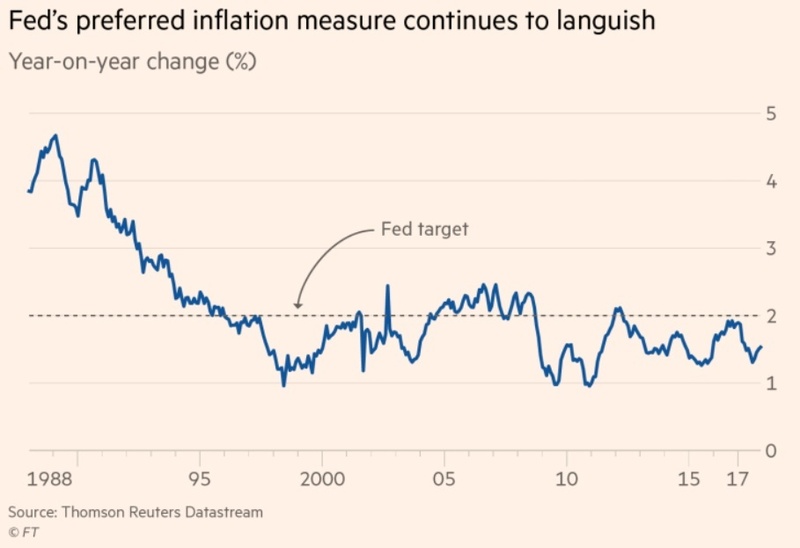 The co-chief investment officer at Bridgewater is worried more about the Fed than about the data: "We think inflation is more of a non-issue than an issue, but it could be a problem if the fear of inflation causes a central bank mistake." Citi likes noise, lots of noise. A hot print tomorrow could "wrongfoot" those dismissing the inflationary threat. The top honcho at Weeden is a dismisser. "Is there anything really that different today than a month ago?" .... 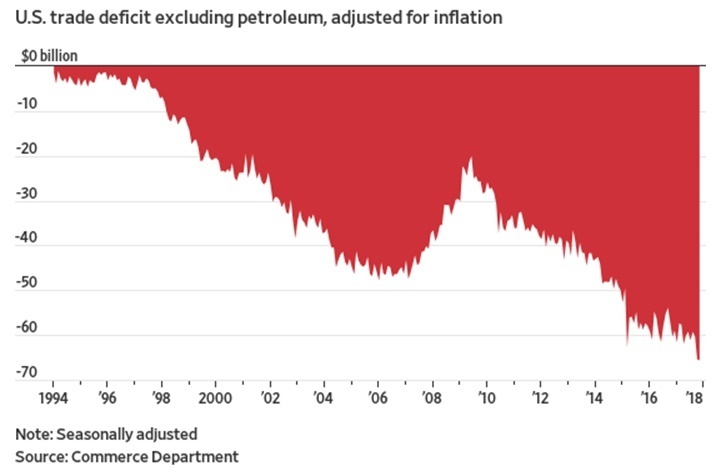 He adds "the tectonic forces that have suppressed inflation for decades, such as de-mographics and technological disruptions, remain firmly in place. This economy hasn't shown any real sign of inflation in 25 years, despite a series of booms and busts over that period." Then there's Ray Dalio, who worries about a recession in 18-24 months. Bloomberg reports he said "We don't know exactly how far we are from the top in the stock market and then the economy, though it is clear that we are past the top in the bond market." 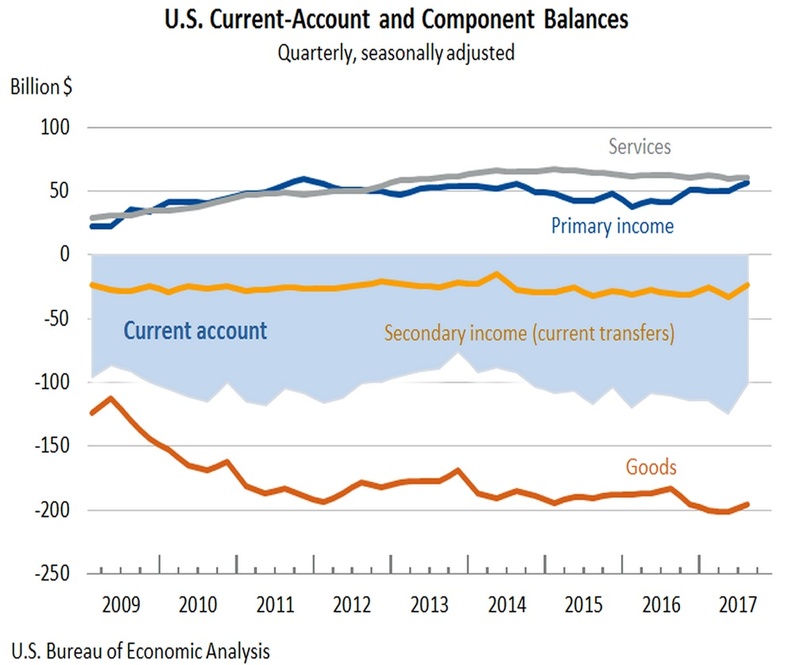 The tax cut and renewed deficit spending are "hitting the gas into capacity constraints that will lead to nominal rate rises driven by the markets." The Fed have a hard time getting policy right. Dalio is looking forward to the 2020 presidential election. "Frankly, it seems to be inappropriate oversight to not be talking about the chances of a recession and what that recession might look like prior to the next election." Dalio is an important guy and his views matter... but we'll take Nobel economist Shiller this time. Shiller is the inventor of the term "irrational exuberance" expropriated by Alan Greenspan. He tells the FT today that conviction of pending correction had been widespread. Okay, now we've had it but it's ambiguous what happens next. "When people believe a market is overpriced but buy anyway, which is what had been happening before the correction, ‘that's almost the definition of a bubble. If you think it's overpriced but think it still has time to go, that's the definition of a bubble.'" We like Shiller's definition better than a list of characteristics like number of IPO's, IPO swift rise, and so on. We also like the idea that the next moves are unknown. There is a good chance it's ain't over. Our short-term thinking is so short-term—three days!—that we lose all perspective. A good (i.e., low) inflation reading tomorrow may very well keep the stock market gang happy, but consider that history teaches us that once a market gets a bee in its bonnet, it doesn't let go easily. Fear of inflation and all the rest of it can come back with the same force, or more. Or another fat sell-off can happen for no reason whatever. The FT has a splendid review of a Deutsche Bank analysis that points out we have had only three such instances in the last 30 years, the first two the Alan Greenspan surprise in 1994, and the Taper Tantrum of 2013. In the 1994 event, Greenspan surprised with a 50-point rate hike and several more hikes total-ling 2.5% in a single year. The Event lasted 60 days. 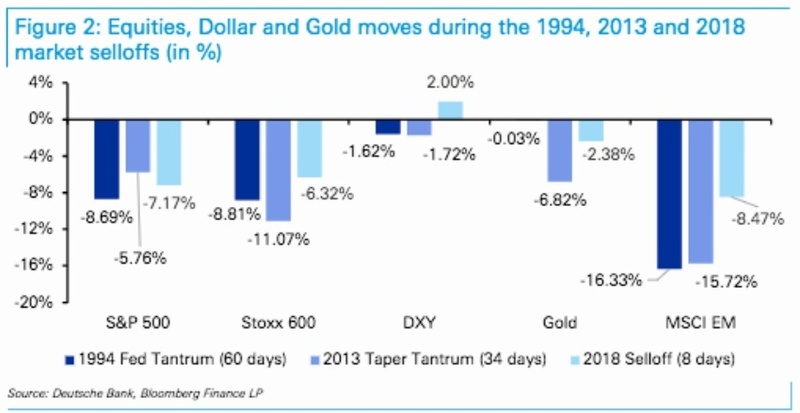 In the 2013 taper tantrum, there was no actual Fed action, just Bernanke talking about ending QE. The Event lasted 34 days. The current Event? Eight days. 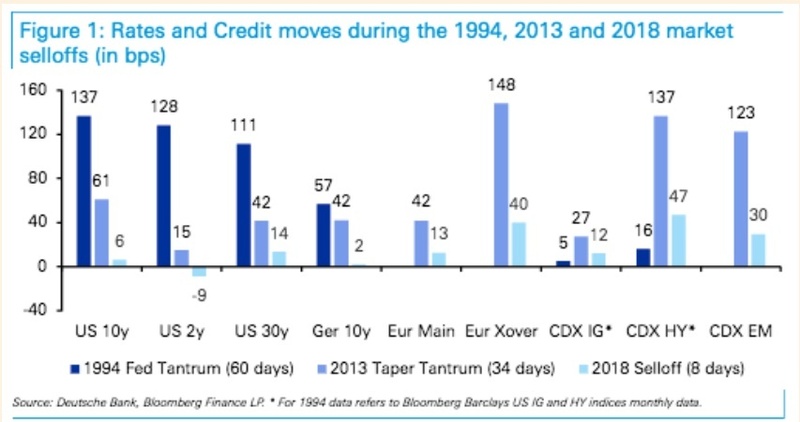 Look at the Deutsche Bank chart, especially the stock market vs. yield comparison. This time the fixed income market barely burped. The second chart is hard to read but stick with it. The dollar index is in the center. During the first two events, the dollar fell. This time it rose. For some reason, gold is missing for the 1994 event. Another noteworthy difference is the MSCI index responding a lot less to the US stock market this time than in the earlier events. Emerging markets suffer when the dollar goes up because so many have dollar-denominated debt, but evidently that effect was not in evidence this time, and was bigger during the two events when the dollar down. This is an aberration. Here might be a good time to repeat that the Shanghai fell so hard in the current week it is now sitting on the 200-day moving average and at levels last seen in Oct and Dec 2015. See the chart. It's a weekly chart. We recall that at the time, the S&P was following the Shanghai. What does the Shanghai shakeout mean? Probably that it doesn't take the US equity indices to lead. A glance at the Bloomberg global equity indices shows a sea of red. The Nikkei and Topix both closed down today, although the Shanghai and the rest of Asia reversed and put in gains. European bourses are mostly lower at just past noon in the European time zone. The little table is copied from the WSJ. This can change, of course, but if we ac-cept that contagion is a real danger and we have seen it before, the next US equity drop may have noth-ing to do with US inflation or even US animal spirits, but arcane things like debt levels in China. We haven't talked about that as a top factor in over a year. It's probably a safe bet that the stock market rout is not one-and-done. 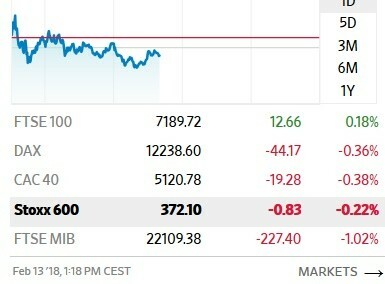 Countering that view, which is built on our reading of market habits, is the observation late yesterday in the WSJ that the rout returned P/E's to where they should be, or close. "Companies in the S&P 500 are trading at 16.5 times their earnings, according to Morgan Stanley data, which blend firms' past profits with forecasts for the next year. That compares with the index trading at 18.1 times those earnings two weeks ago, and it is much closer to the S&P 500's 10-year average of about 15." The WSJ also offers a dandy chart showing that stocks still offer about 5% more return than TIPS. We have no idea whether 5% is the appropriate pre-mium, but it's simply wonderful to see returns calculated this way. Bottom line, we were never too happy with the recent trajectory of FX prices favoring the dollar, not because of looming inflation—we trust the Fed—but because the purported reason for the dollar rise was so stupid. Buying into a negative correlation because the market is in a panic is inherently unrea-sonable. Markets are quite often unreasonable, of course, but on the whole, the FX market is more rea-sonable than most, and on a par with fixed income. The crazies can control commodities like oil and the stock market, but bonds and FX are ruled by sharp brains and astute assessment of participants' mentalities. Except when they are not. A final point: Bill Gross is selling his stamp collection for over $9 million. Somehow you just knew this guy had a stamp collection. Equity guys, in contrast, collect action figure dolls.